"It's too small for a alligator, too big for a lizard. What is it? A baby dinosaur?" Back in the 1950s, fear of the affect of nuclear radiation led to a series of films that featured mutated insects and animals that maraud through the countryside or desert in hideous matte shots looming over screaming humans. Ants, rabbits, spiders, etc. all had their run. This gave way in the '60s to the concept of nature fighting back against the perfidy of world-destroying man. Even this gave away to a more mindless type of thing, sort of a less intelligent Alien-ish concept in which an "unknown force or thing" is attacking for no apparent reason. Fortunately, Silent Predators fall somewhere in a more positive area of the genre. The relative intelligence of the teleplay is probably due to the writing credit given to John Carpenter. Known for directing and producing, Carpenter is responsible for the Halloween series, Escape from New York and Escape from L.A., as well as the recent Ghosts of Mars and Vampires. Here his story is realized on a low, low budget by professionals who turn out a solid product. A sleepy little backwoods California town has fallen victim to a developer, who is determined to throw up cookie cutter homes for sale to the masses. The film uses the Jaws formula for the first two thirds and then changes to a kind of "Indiana Jones and the Cave of Snakes" as a rescue finale. A large part of the watchability of Silent Predators is the solidly professional acting, in what could have been a ludicrous experience, of Harry Hamlin as the heroic but troubled fireman who has moved to this small town under a mysterious cloud, and Jack Scalia as the unscrupulous, fast-talking salesman who is determined to build and sell his houses no matter what the obstacle. Against a relatively unknown cast of TV movie drones, they shine for bringing to life two characters in typical a TV movie setting. Hamlin starred in the successful television drama LA Law, but his film career never quite took off (except for the cult class Clash of the Titans). Scalia has appeared in numerous B-Films and always turns in a quality performance. The movie is well paced and the suspense is decently contrived. Snake-eye views of some scenes adds to the suspense interestingly, although it is somewhat of a red herring for motivation on the part of the snakes. The various attacks differ enough from one another to always remain interesting. Especially fun is the snake attack on a little league baseball game. One can quibble about the quality of the special effects, but there is no doubt that a couple of the scenes were decently intense and definitely got me to where I was not looking forward to the next appearance of the snakes. This is not a great film, but it is a good one in its genre and is definitely worth a rental for a quick shock treat. The main quibble might be that with this soundtrack, the predators are anything but "silent." With it low level of gratuitous violence and decent shock value, this is a good film for kids to get a fright on a Saturday night. Image Transfer Review: The video transfer is very typical TV-movie quality. This was a low budget film to begin with and this results in a low-budget look with not much post-processing. Much of it looks as if it was grabbed in one take. Full-frame, or "family friendly," Silent Predators is definitely "video" all the way. Audio Transfer Review: The best part of Silent Predators is the Dolby 2.0 Surround soundtrack. 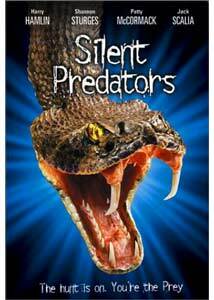 The rattles of the "silent" predators create a constant level of creepy suspense. The music is typical TV-movie stuff, but the sound is decent and not muffled or distorted. Extras Review: No extras. Look for this one in the cut-out bin, if you want to own it. Silent Predators is a familiar genre with familiar style and familiar faces. Still, it manages to score a little higher than its fellow creaure features. Worth a rental, at least.